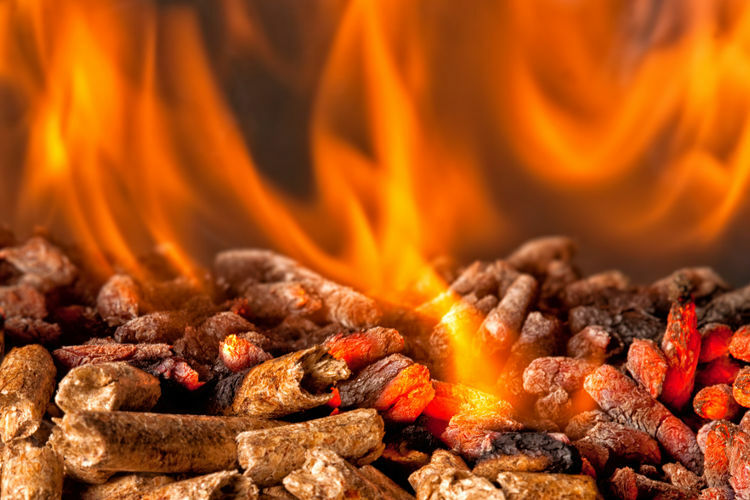 Biomass heating is a form of renewable energy focused on burning organic materials, commonly wood based sources such as pellets, wood chip and logs, instead of fossil fuels. This is considered to be a carbon neutral method of producing heat, as the carbon dioxide released when an organic material is burned is only that which was absorbed by the plant during its life. Continue reading to learn more about how biomass heating works, its advantages and things to consider before installing biomass heating in your home or business. Primarily it consists of a biomass boiler, a fuel, fuel store and thermal water store (or buffer vessel). Wood fuel is burned by the boiler, the hot gases pass through a heat exchanger. This heat is transferred via circulated water and stored in the buffer vessel. The buffer then ‘feeds’ heat to a heating and/or hot water system. As the heat in the buffer is depleted the boiler reheats it. Reduced carbon footprint – Biomass fuels produce only a fraction of the carbon emissions of fossil fuels. Burning fossil fuels results in converting stable carbon, which was sequestered millions of years ago, into atmospheric carbon dioxide, whereas burning wood returns to the atmosphere contemporary carbon, recently taken up by a growing plant. This is sustainable as long as the carbon dioxide is captured for its own regrowth. Renewable energy source – A wood fuel supply is sustainable. As it is a living source of energy, there is potentially no limit to how much can be grown and used. This also means it is not subject to the price hikes of oil and gas. Low fuel costs – Biomass fuel is around 40% cheaper than oil butane and electricity. Financial support – The Renewable Heat Incentive (RHI) is for domestic, commercial, public or industrial users of biomass heating. By installing a wood boiler or a pellet stove, you can receive quarterly payments for seven years (domestic) or 20 years (commercial, industrial and public) for the amount of clean, green renewable heat that your system produces. Space – Biomass boilers can require a large amount of free space for the unit and are therefore unsuitable for smaller properties. The fuel for biomass boilers can also take up quite a lot of space, and buying in smaller amounts is often more expensive. Maintenance – Most biomass boilers and stoves require some regular cleaning to ensure optimum performance. Cost – There is a relatively high cost on initial installation, however this should be balanced with the financial incentives from the government and lower energy bills which are on offer in the long term. Design – We can provide an initial site survey and heat loss calculation with hot water use and re-heat time to determine the capacity and design of the system. Previous Previous post: Regulations to get you Hot Under the Collar!